The MPS is proud to introduce their first-ever customized firetruck, designed exclusively to meet the needs of the SMSC. The new truck will offer Community members and guests superior EMS and fire-response services, with more unique and advanced capabilities to help respond to calls more effectively. Years in the making, the truck is a Pierce 107, and the first of its kind in Minnesota. 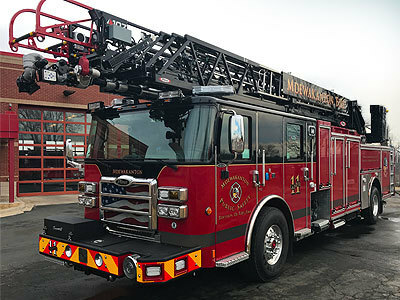 It is a lightweight ladder truck that can serve both EMS and fire-response emergencies. A few of the improved features include better ladder capabilities and a Compressed Air Foam System, which is seven times more effective in fighting fire than water alone. Being smaller and lighter in weight, the truck will do less damage to the roads and give MPS the ability to fit in tighter spaces, ensuring greater safety to the SMSC as a whole.